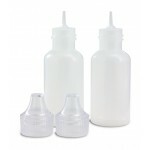 Applicator bottle with nozzle and screw on lid - 36ml great for small quantities of glue or paint for finer works. 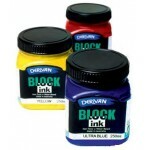 Ideal for dot painting! 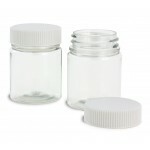 ..
Small bottle/jar with lid, great for inks etc. - 30ml ..
Glitter Glue 3D KindyGlitz Metallic. 36ml dispenser bottle. See the Colour Chart here. Please select the colours you require from the Available Options. Derivan 3D Kindyglitz is an acid free, archival quality, dimensional paint and glue, great for adding a little glamour to papercra..
Glitter Glue 3D KindyGlitz Fluoro. 36ml dispenser bottle. See the Colour Chart here. Please select the Fluoro colours you require from the Available Options. Derivan 3D Kindyglitz is an acid free, archival quality, dimensional paint and glue, great for adding a little glamour to pap..
Glitter Glue 3D KindyGlitz Gem. 36ml dispenser bottle. See the Colour Chart here. Please select the colours you require from the Available Options. Derivan 3D Kindyglitz is an acid free, archival quality, dimensional paint and glue, great for adding a little glamour to papercraft, c..
Glitter Glue 3D KindyGlitz Glitter. 36ml dispenser bottle. See the Colour Chart here. Please select the colours you require from the Available Options. Derivan 3D Kindyglitz is an acid free, archival quality, dimensional paint and glue, great for adding a little glamour to papercraf..
Glitter Glue 3D KindyGlitz Puff. 36ml dispenser bottle. See the Colour Chart here. Please select the colours you require from the Available Options. Derivan 3D Kindyglitz is an acid free, archival quality, dimensional paint and glue, great for adding a little glamour to papercraft, c..
Glitter Glue 3D KindyGlitz Slick. 36ml dispenser bottle. See the Colour Chart here. Please select the colours you require from the Available Options. Derivan 3D Kindyglitz is an acid free, archival quality, dimensional paint and glue, great for adding a little glamour to papercraft, ..
Derivan Acrylic Artist Paints. 250ml. See the Colour Chart here. Please select the colours you require from the Available Options. 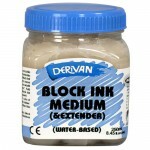 Application Derivan Acrylic is formulated to be used by tertiary students and artists as a full-bodied acrylic colour. 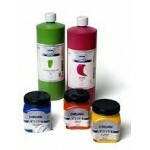 Derivan Acrylic may also be use..
Derivan Acrylic Artist Paints. 1 Litre. See the Colour Chart here Please select the colours you require from the Available Options. 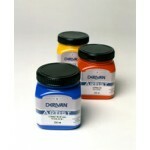 Application Derivan Acrylic is formulated to be used by tertiary students and artists as a full-bodied acrylic colour. 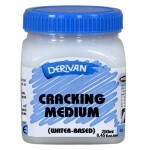 Derivan Acrylic may also..
Crackle Medium - 250ml. These mediums add even more versatility to the Student and Artist ranges, unlocking the door to many different techniques. 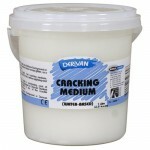 There are many different painting mediums to help change and manipulate acrylic colours so that any artist can achieve almost any effect.Water..
Crackle Medium - 1Lt. These mediums add even more versatility to the Student and Artist ranges, unlocking the door to many different techniques. There are many different painting mediums to help change and manipulate acrylic colours so that any artist can achieve almost any effect.Water-based ..
Derivan Face & Body. 250ml jar. See the Colour Chart here. Please select the colours you require from the Available Options. 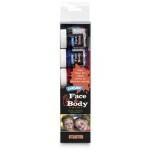 It is advisable to use Face & Body paint over a "barrier" or hand cream to make it even easier to remove from the skin. 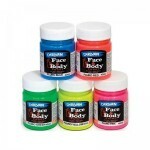 Do not use on persons with s..
Set of 5 40ml pots Fluoro colours - Red, Pink, Yellow, Orange, Green Derivan Face & Body paint is a safe, non-toxic paint for use on the face and body. It is designed as a drama and theatre paint which can also be used for fetes, fairs, children's parties and wherever face and/or body paint..
STARTER KIT Colours and Sponge & 2 Brushes - 5x40ml..
Derivan economy gesso primer - 500mlDerivan Gesso is a great primer for canvas, board or even paper.The strong white ground gives an excellent tooth for easy paint manipulation.Being a water-based product, Derivan Gesso can be thinned down with water if desired. 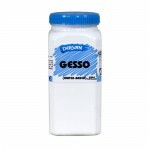 If working on canvas, Derivan Gess..
Derivan Gesso 4LDerivan Gesso is a great primer for canvas, board or even paper.The strong white ground gives an excellent tooth for easy paint manipulation.Being a water-based product, Derivan Gesso can be thinned down with water if desired. 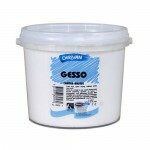 If working on canvas, Derivan Gesso will tighten the c..
Derivan economy gesso primer - 2ltDerivan Gesso is a great primer for canvas, board or even paper.The strong white ground gives an excellent tooth for easy paint manipulation.Being a water-based product, Derivan Gesso can be thinned down with water if desired. If working on canvas, Derivan Gesso ..